Microsoft has announced pricing for its Microsoft Surface tablets powered by Windows 8 Pro. There will be two different variants of the tablet with the 64GB model priced at $899 and the 128GB model tagged at $999. Both tablets come with the Surface pen using Palm Block technology which allows the screen to recognize the pen as an input but won't recognize a palm touch. The pair also support the Touch Cover ($119.99) with its flat, touch-sensitive QWERTY, and the Type Cover ($129.99) which employs a more traditional QWERTY with raised keys. While on the outside the Microsoft Surface Windows 8 Pro tablets resemble the less expensive Microsoft Surface RT device, inside the Pro is powered by a Intel Core i5 processor which the Redmond based manufacturer says will provide a graphics boost for the 1,920-by-1,080 display. A USB 3.0 port is on the device. The Microsoft Surface RT, with its ARM based processor, is more of a traditional tablet, competing with the Apple iPad and Android tablets. Microsoft calls the Surface running Windows 8 Pro both a PC and a tablet, noting that can run your current Windows 7 desktop application. The Microsoft Surface Windows 8 Pro tablets weigh less than two pounds and are less than 14mm thick. Microsoft says it expects to launch the tablets in January. The tablet space is about to get a little more interesting. Agreed. Great device, but I was hoping it would start about $100-200 lower. Well, honestly I was hoping it would be about $100 more than the Surface RT, but I knew that wouldn't happen. So /realistically/ I was hoping for $100-200 lower. That said, still a good price. Same range as an Ultrabook, with a touchscreen, and great weight and size. Really shows off how much the mac computers are overpriced, and they don't even have (nor will they soon, more than likely) touchscreeens. It is just a matter of time before the Mac computers get touch screens. Maybe the Surface Pro pushes Apple to include touch screens in the MB Air in the next refresh? Anyhows, it is a matter of when, not whether. I would love it if a Retina Macbook Pro had a hinge that goes all the way around and a touchscreen. That would an amazing tablet. Indeed. But with that price? It's waay too expensive for a tablet. I think the Surface Pro should be considered as an ultra computer rather than a tablet. Then, it looks more appealing. At $1028 (Surface+Type cover), it indeed falls into the ultraPC category price. This "tablet" with 4hrs battery life, very heavy will not compete with "normal tablets". This is a laptop in disguise. 899? Expect failure like RT we anticipated....... Microsoft has just decreased orders of RT...... when do you learn and sack all the management? Why a failure? It's meant to be more than just a regular tablet, essentially a full PC in tablet form that's optimized for the platform yet cheaper than a MacBook Air. RT is still just as useful, productivity-wise, as any other tablet OS currently available. Rt version compete ios Pro version compete mountain lion Did you get the picture? If Apple did this, they'd be in the same league as Microsoft because frankly, Mountain Lion is awesome. I'm starting to really like Mac computers. It's actually somewhat cheaper than the competition. The macbook air costs $999 but comes with 64GB RAM. Still, we bash apple for being way too expensive when microsoft is barging on their territory. 64 GB RAM would be nice! The Surface Pro has virtually the exact same internals as the basic Air, plus a better screen. Actually, it has more storage space, and i meant 64 GB ssd capacity, it actually has 4 GB RAM, my apologies :P Still, I truly despise windows 8, I was a huge fan of windows 7 back in the day, but right now it's pretty boring. I wanted a decent and portable laptop, quick boot-up (maximum 15 seconds to go from completely switched off to 5 tabs on my browser) an awesome keyboard and trackpad. I went for a mac and I have come across some frustrations, but nothing that made me regret my decision. This is coming from a windows 7 enthusiast. I still use my windows 7 gaming rig for what it's built for and I have absolutely no intention of getting windows 8. I also have a samsung GALAXY Note and the only phone I'd get over this one would be the Note II. Looks good to me.. Finally there is something that can replace my laptop.. Personally I'll be waiting for the Lenovo Think lineup (not the IdeaPad junk) as I've had nothing but praise for the Thinkpads I've used over the years. Still will take a good look at MS's Surface Pro offerings come next year since the Zune HD left a really good impression on me. Overpriced, anyone can obtain a better PC with dedicated graphics instead of that crappy lowly clocked dual core i5 with that underpowered HD4000 graphics.. Msft is adopting Apple's way of marketing with exaggerated prices..
what your forgetting is that apple sells a tablet which runs a watered down OS with limited capabilities. This is not only a tablet, its a full pc with full capabilities. So in my opinion MSFT just out did apple by not only doing one better customers will eventually see more value in the surface. So finally its coming. I sold and saved the money I got from my iPad 3 just to wait for this beauty. Now I can have a tablet and a PC all in one. I just love technology. Thank you Microsoft. I have been dreaming of this from the 1st day I heard about the OG iPad. I think people make the mistake in comparing it to other tablets when in fact it should be compared to an ultrabook or macbook air with a touchscreen. Pricing looks reasonable to me. I would buy HP Envy X2 or Asus Vivo Tab... 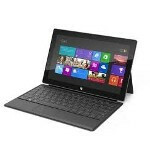 They are Windows 8 tablet PC and cheaper. Which is a great thing about WIndows: choice. This is essentially MIcrosoft's Nexus tablet: built and priced how they want it as a benchmark, and let the other OEMs do their own thing.